So what is Cheese Rolling? 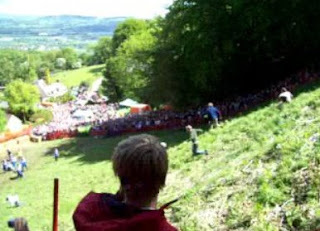 Each year, more than 3,000 people gather on a hillside, in the English county of Gloucestershire, to watch around 100 people throw themselves down a steep slope, which is 200m long and has a 1:1 gradient in places, in hot pursuit of a 7-8lb Double Gloucester cheese, which can reach speeds up to 70mph. To be honest, nobody really know why! It has been suggested that Cheese Rolling can be traced back to Roman Times, or it could have been a pagan healing ritual. 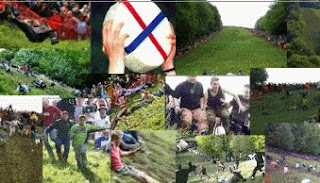 But whatever the origins the annual Cheese Rolling, at Cooper’s Hill, has become a ‘must visit’ event, not just for the locals, but attracting visitors from across the entire world. There are 5 downhill races - 4 races for men, with one, increasingly popular, race for women – and 4 ‘easier’ uphill races – for boys, girls, men, and women. The event lasts less than 90 minutes and, for those brave – or stupid – enough to chase the cheese it can be a dangerous race. But as an old British (well Gloucestershire tradition) it can't be beaten! The event in 2007 resulted in 20 people being treated for minor injuries – the lowest for some years (2006 figure was 34). Injuries normally include cuts, bruises, sprains and even concussion. Funny enough i was going to send you the tale of this and i thought you would think i was making it up. It does indeed take place at Coopers Hill a tiny village near Stroud on the far side of the Cotswolds to our side in Oxfordshire, and in the next county of Gloucestershire. It took place at the weekend, but we have had a very wet warm summer so far this year, and while it is normally suicidal this year is was beyond suicidal. I have visited the place a couple of times when the rolling is not on and once when it was, and each time your breath is taken away by how long and narrow that particular escarpment is. We live in an area of such Down land as it is called, ( hills are called Downs or Wolds. ) which have these steep sudden fall away like grass covered sloping cliffs. I am surprised that this years event went ahead after the rains, as you can imagine what it was like on wet grass. What i am not surprised is; that the winner and and a few other competitors are at present in Hospital on traction, with spinal injuries. Is that Sir Dayvd in that pack? Just another reason I HAVE to get across the pond someday. Yes, it does sound like a Monty Python skit. It also sounds like something the Knights of Moleskine, Spirit, and Ale would do. How about instead of cheese we use a keg or mini keg of beer? As long as they aren't playing tennis with Scotsmen.